Transitioning from American food to Vietnamese street food was a lot more difficult than I anticipated. During our first two days in Saigon, The Astronomer and I stayed in our comfort zones and ate at restaurants heavily influenced by Western aesthetics. The tables were far off the ground, menus contained English translations and set prices, walls were painted vibrant colors, floors were spotless, waiters donned matching uniforms, and napkins were readily available. The only thing Vietnamese about these joints was the cuisine. Even though we felt like schmucks paying higher prices for superficiality, we clung to the safety of the familiar. 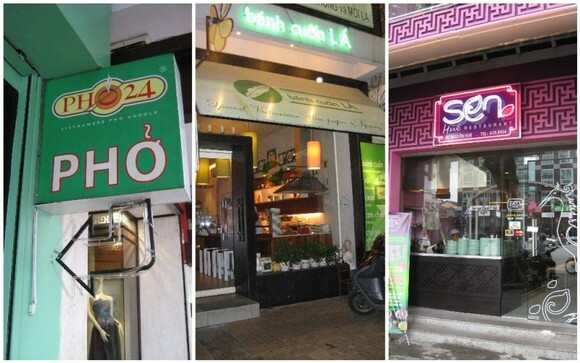 Our first experience in Vietnamese “haute” cuisine was at Sen – Hue Restaurant. By the way, Sen refers to the lotus flower that grows throughout Vietnam. After receiving Free Hugs from giddy teen girls on our first morning in the city, The Astronomer was hungry for a second breakfast. He liked what he read on the menu placed outside Sen, so we headed in and were seated at a smallish table for two. What stood out most about Sen was their tableware – plates, bowls, cups, spoons, and dishes all contained the purple Sen logo and were glazed a serene green. Such attention to detail was a bit unnerving, but admittedly appealing. 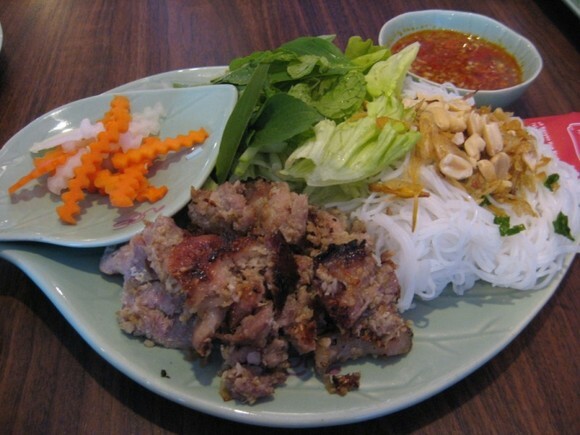 The Astronomer ordered Bun Thit Nuong (vermicelli noodles with grilled pork) and thought it comparable to versions he’s had in the states. Even though he was warned incessantly by guidebooks and his mother to avoid fresh vegetables, he went ahead and ate the greens accompanying the bun. Sen had a Happy Hour special during our visit and thus we received a free dessert, Che Troi Nuoc. 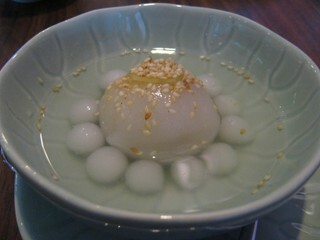 Traditionally, this dessert consists of gelatinous balls filled with sweet mung beans, but Sen’s version contained a beef and shrimp mixture. The balls sat in a gingery broth and were topped with toasted sesame seeds. The che was very good, but I prefer the mung bean version. 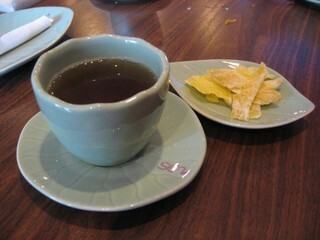 We ended our meal with lotus blossom tea and candied ginger. The total cost of this meal was $4.08. Our second foray into fancy Saigon dining was at Pho 24, which boasts over 200 locations throughout Vietnam and South East Asia. I ordered pho tai sach (beef noodle soup with tripe), while The Astronomer had pho tai (no tripe). 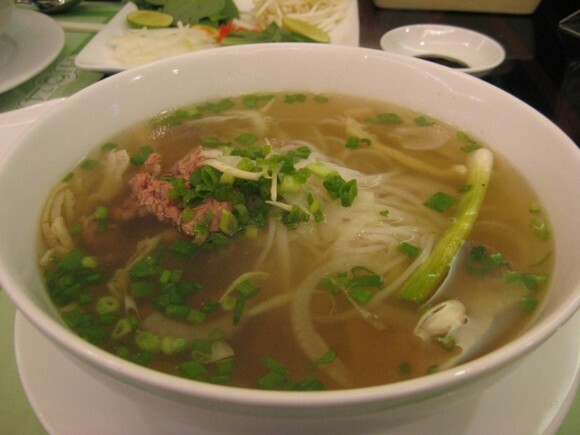 Our bowls of pho were pretty wimpy compared to the enormous bowls served in America, but the quality was superb and the broth was so good that we slurped it all up. 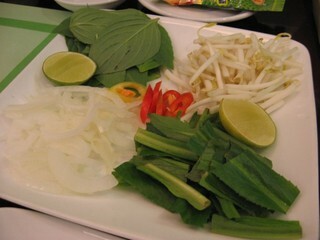 Our pho‘s accompaniments (limes, bean sprouts, basil, etc.) were served on a square plate! 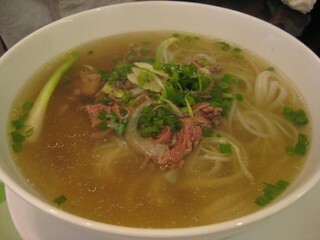 My bowl of pho was priced at $1.25 (20,000 VND), while The Astronomer’s was $1.10. Dirt cheap by American standards, but moderate on the Vietnam scale. 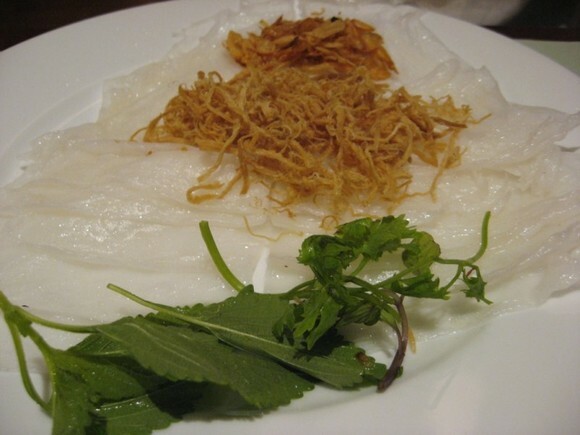 Our final fancy feast was at Banh Cuon La. 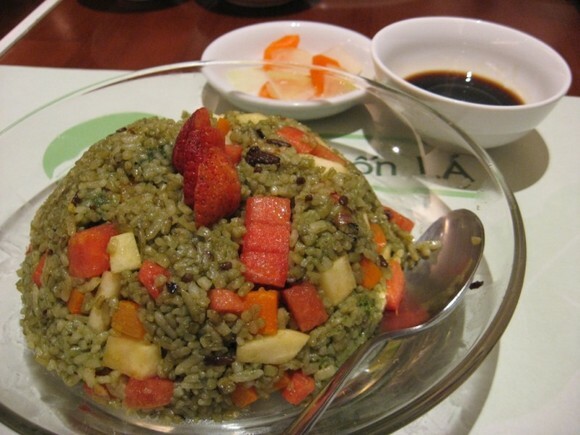 Craving fruit like no other, I ordered com chien trai cay (fried rice with fruits). The rice contained watermelon, apples, and carrots and was topped with slices of strawberries. I added a bit of soy sauce to bring out the fruits’ sweetness. Although fried rice with fruits sounds a bit odd, it’s really very tasty. The Astronomer ordered banh cuon thit cha bong (thin rice flour crepes with dried pork) and a sinh to dau (strawberry smoothie). The banh cuon was good, but the meager portion left The Astronomer hungry—one American trend yet to catch on in Saigon is giant portions. The strawberry smoothie was a refreshing treat. totally agreed with you. these places are for the tourists that are agraid of venturing out. the prices in Sen is not worth to try it and Bank Cuon La is so so that you feel cheated paying for that kind of the price when you can get better quality food for 1/2 the cost. BTY, the water quality in VN has improved greatly now versus a few years ago so if you come to a quan that is clean, you can ask them if they wash their raw vegetable in “nuoc rua rau sach”, they will tell you. if so, then enjoy the the raw vegetables…many of my American friends and colleagues come here and in placed that i have taken them there hasnt been anyone being sick yet…cross my fingers. today in all over the market in VN they sell “Veggy” which is the same as our US side to clean the vegetables and many small “quan” use this products.